To reverse engineer it, I had to open my original fold, and try to reproduce the fold, a bit like working on a crease pattern. 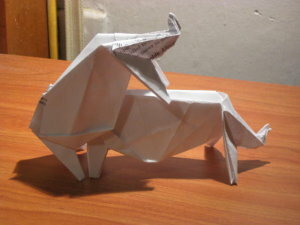 I did my first version on some draft paper, so now I have a total of three rhinos. I even managed to take a photo of them playing with each other, national geographic style (may be considered nsfw). Expect to see full instructions for the rhino sometime soon. Some time ago, along with the newspaper, came a lottery ticket. Believing that gambling is a form of taxation for fools, it was just lying around. Then one day I discovered it has a ratio of exactly 3/1. 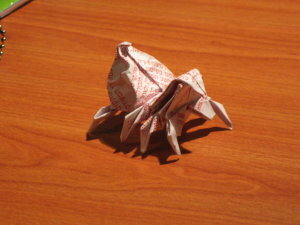 I decided to try something new, and came up with the following creation, which I dub, ‘lottery spider’. It has a venomous, addictive sting, beware! 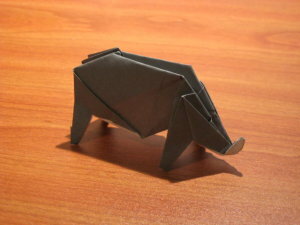 This entry was posted in Origami and tagged lottery, Origami, rhino, spider. Bookmark the permalink.